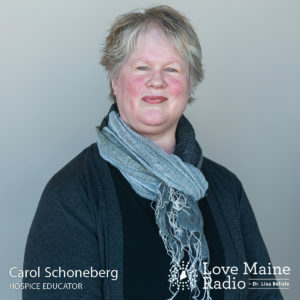 Carol Schoneberg has been a hospice educator in Maine since 1992. She has served as an end-of-life educator, bereavement services manager, and grief counselor at Hospice of Southern Maine—Maine’s only free standing not-for-profit hospice—since its inception in 2004. Carol provides end-of-life education to staff, volunteers, healthcare providers, universities, and the community at large. Certified as an advance care planning facilitator trainer through the Respecting Choices program at Gundersen-Lutheran Hospital in La Crosse, Wisconsin, she believes strongly that helping people talk about their choices for end-of-life care can make a huge difference in the way families experience the dying process. Her experiences working with the dying and the bereaved have inspired and taught her much about the resiliency of the human spirit.